1.053, 1.064, 1.3 and 1.55 μm wavelengths. 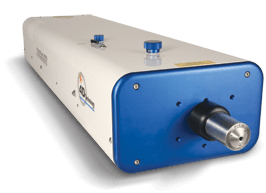 The PhaseCam® NIR interferometer is a compact, lightweight, dynamic laser interferometer for accurate surface and wavefront measurements at near infrared wavelengths (1.053, 1.064, 1.3 and 1.55 micron). Each PhaseCam laser interferometer employs Dynamic Interferometry® technology to acquire measurement data in less than 30 microseconds. Because acquisition time is so short, the instruments are insensitive to vibration and air turbulence, enabling use in difficult environments such as production floors, clean rooms and environmental testing chambers. Beam Ratio adjustment ensures maximum fringe contrast, enabling measurement of optics with reflectivity from 1–100%. PhaseCam NIR systems include 4Sight™ advanced wavefront analysis software, providing extensive 2D and 3D analysis and visualization tools, as well as comprehensive filtering, masking, database and import/export functions. Applications for PhaseCam NIR systems include measurement of optics for astronomy, surveillance, guidance and directed energy.